Circa 1700, very stylish early Lombardy mulberry and fruit wood linen press. The stylish architectural pediment has multiple mouldings between the outside and the inner doors which continue around the side. At the front there are two large doors with raised fielded panels and Flemish style framing. The centre panels are of mulberry as are the ogee mouldings on the side and there are multiple inlays of satinwood and ebony. 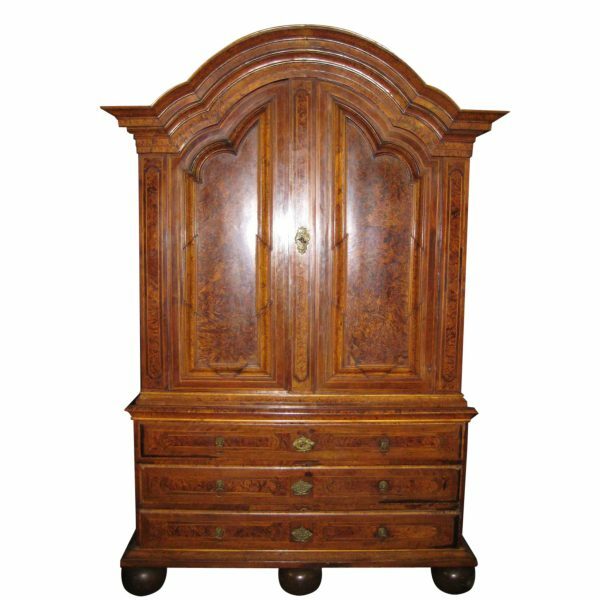 The doors have a very stylish escutcheon and original key, and open to reveal a section inside with a series of double shelves with drawers in between. The drawers are veneered in mulberry and at the top there are some shelves with rounded mouldings on the front. The doors are pin hinged. On the top gables there are inlaid panels at the side again with geometric patterns in different woods. The similar pattern occurs on the base. Beneath the top section there are several mouldings with the facings of the mouldings veneered in mulberry also. At the bottom there is a configuration of three long full length drawers that graduate from top to bottom. The drawers have very stylish escutcheons, with an unusual lifting handle on the escutcheon and lion mask handles left and right with ring support lifts protruding from the mouth of the lion. Beneath the bottom drawer there is an extremely deep ogee moulding and the whole piece stands on large bulbous feet giving it a very stylish look to it. The piece is a good colour and great condition.